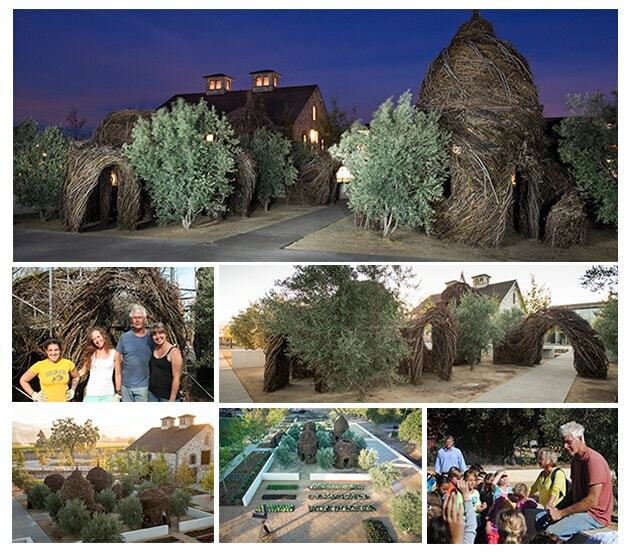 Patrick Dougherty uses tree saplings as his artistic medium. His interest in nature and its inherent magic dates back to his youth in rural North Carolina, where he would build tree houses, forts, lean-tos, and hide-outs to the delight of his many younger siblings. Created by interweaving branches and twigs together, Dougherty’s work alludes to nests, cocoons, hives, and lairs built by animals, as well as the manmade forms of huts, haystacks, and baskets. His work typically appears found rather than made, as if it had been created by the natural forces of a tornado. Dougherty intentionally pursues this effortless effect, as though his creations just fell from the sky in a gust of wind or grew up naturally in their settings. Dougherty earned a BA in English from the University of North Carolina in 1967 and an MA in Hospital and Health Administration from the University of Iowa in 1969. He later returned to the University of North Carolina to study art history and sculpture. Combining his carpentry skills with his love of nature, Patrick began to learn more about primitive techniques of building and to experiment with tree saplings as construction material. In 1982 his first work, Maple Body Wrap, was included in the North Carolina Biennial Artists’ Exhibition, sponsored by the North Carolina Museum of Art. Over the last thirty years, he has built more than 230 sculptures. More about Patrick Dougherty at www.stickwork.net.